How accurate are the AMZ Insight’s sales estimates? We get that a lot from our users especially those who are relatively new. Let me tell you first that there’s no way anyone can get these very important figures from Amazon who is not the part of their data team. So, we at AMZ Insight tracking hundreds of products from all categories to collect massive data. Then this data is analyzed by our full time employed senior data scientist to form the algorithm of sales estimates. We continuously track Amazon BSR history, Buy box, reviews and other data of hundreds of items from each category for analysis. Variety of data analysis techniques help us to form the relation between BSR, reviews and the unit sales. Once we have this relationship on hand then it is much easier to get monthly Amazon estimated sales and revenue for the product. Furthermore, our highly expert team of software engineers then translate the outcomes of data analysis in to the code to show you in numbers. So, you can stay updated with precise monthly estimated sales of your competitors with the help of our Amazon Spy tool. A scattered plot of data points (as shown below) that we collect everyday lead us to establish the relationship between the BSR, reviews, Amazon buy box and the sales. 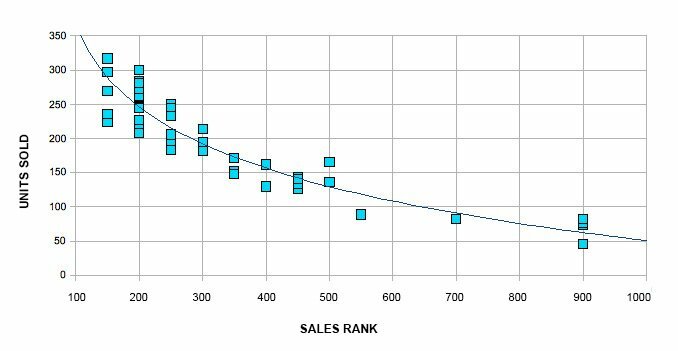 It is very important to understand this relationship that how sales and the Amazon Bestseller Rank are connected to each other. This is very easy, as a rule of thumb the items which make most sales will have the lowest number of BSR and least sold item would have highest number of BSR. As a seller you may already know that BSR 1 in any category is the top rank and increase in this number means lower rank. In the same way, regular sales ensure consistent sales rank. Amazon’s algorithm of calculating the sales rank is mostly based on the number of sales of the particular item. So, sales rank and the sales are interdependent and this could mean the chicken and egg situation for the new sellers. To get out of this you need to aggressively push the marketing efforts. Run Amazon ads to drive traffic and sales to your listing in order to turn this situation into your favor where both sales and sales rank will promote each other. Well, in most cases Amazon estimated sales are incredibly accurate except for the few of them. As you know, we get a scattered graph from our collected data points and the estimates are for a given time period. So, if a product makes a certain number of sales in that time period it’s more likely to make similar sales in future. But, in case there was a huge Amazon promotion running during that time period then it won’t likely to continue selling with that pace and our sales estimates may seem little bit too much for that item. We have also heard from our users that the sales of their own products are sometimes over or under estimated around 20% that’s why they make adjustment in the estimate according to that. Let me tell you that due to multiple scattered data points the average sales numbers that we get are the best estimates so you’re advised not to make the adjustments. We don’t claim the sales numbers are 100% correct for the products but we do say the estimates are up to 90% correct. That being said, knowing how much competitors are making you can focus to counter their strategy. It may also help you in finalizing the best selling products on amazon within your favorite niches. So, use these vital numbers to keep tracking the sales of your competitors and formulate your business strategy according to that. Here’s your free trial link to test it out and see how Amazon estimated sales figures and other tracking data by AMZ Insight can help you improve your business.